LoA_Happy Halloween-Enjoy a fantastic journey! This is the botton of our journey, click it. Ready? Let's go! Click the icon of Happy Halloween, and you will see for parts. 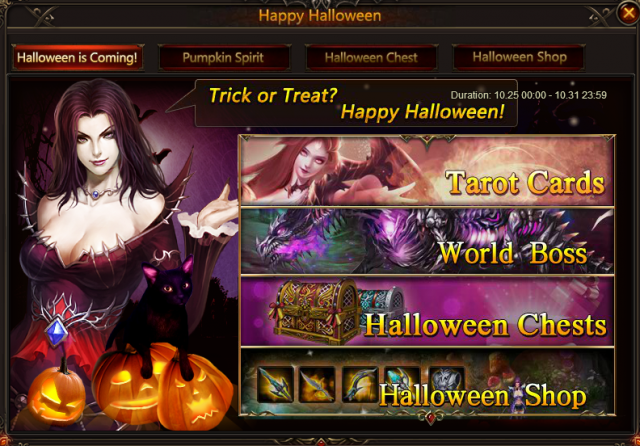 They are Tarot Cards, Pumpkin Spirit, Halloween Chest and Halloween Shop. This is a brand new gameplay where you may find new fun! Click here for more details of Tarot Cards. Fight together and get great rewards here! 1. 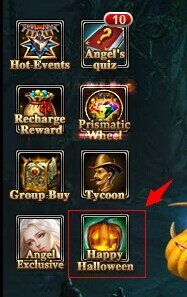 Click Pumpkin Spirit and you can see this panel. There is point recording on the top of the panel, which records the points all players have got in your server during the duration of Happy Halloween. 2. Players can get points by collecting Pumpkins. 1 Marvelous Pumpkin=5 points, and 1 Ripe Pumpkin=1 point. 3. If points reach certain level, all players in your server can get corresponding rewards. As we can see, there are 5 level for points. 4. There are also rewards you deserve for your contribution. Click Point Rewards to collect! Can you and partners in your server reach the top level during the 7-day carnival? Come and try! 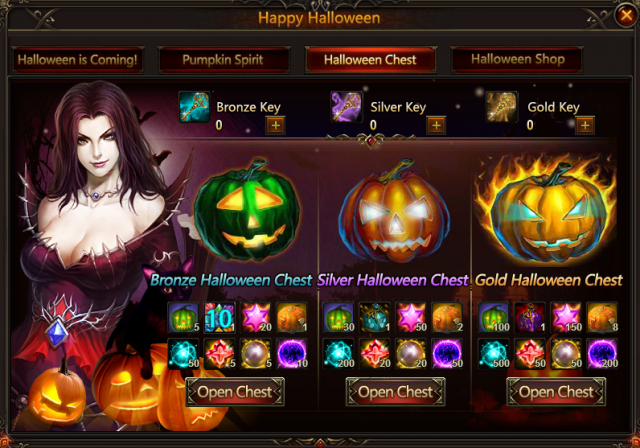 Resources, rare gems and Pumpkins are waiting for you in the chests! There are 3 kind of chests for you, with 3 kind of key to open. You can get keys by achieving hot events, or purchase by diamonds. You wanna to test your luck? Well, you could never know how lucky you guys are until you open the chests! You may ask, how to deal with the Pumpkins I have got? Ok, here comes a chance for you, to exchange items by the Pumpkins! 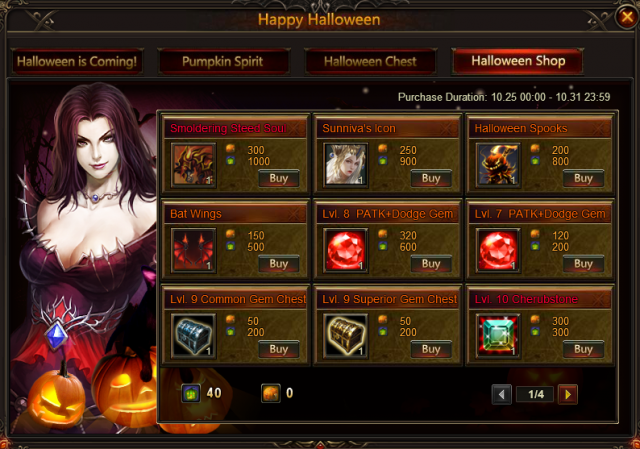 Here you can get New mount Smoldering Steed, new angel Sunniva and new fashion Halloween Spooks as well as Bat Wings, and so many rare items! Now you may wonder where you can get the Pumpkins and keys. Ok, it's time to go to Hot Events! Description: Reach certain achievement to get items for Halloween events! Description: Complete daily challenges, cheer for Halloween! 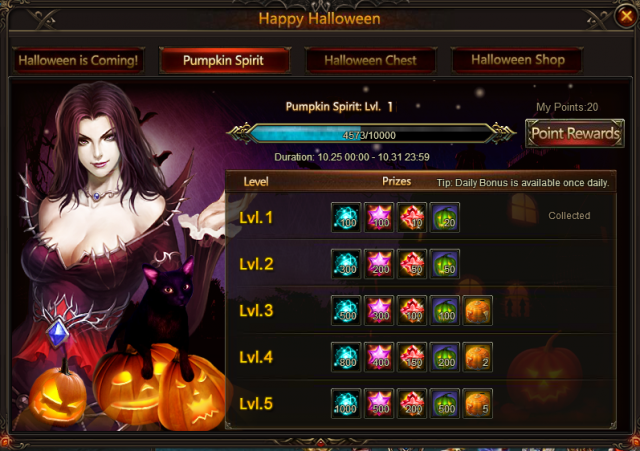 Description: Spend certain Diamonds and collect pumpkin! Now it's time for you to exchange your candies which were collected by check-in. Recharge certain amount to get special rewards during Halloween events! You could win each reward only once during the event. Also, you can get Pumpkins in Pumpkin Spirit and Halloween Chests! Have a good time! More exciting events are coming up through Dec 20 to Dec 26, check them out in the in-game How Events menu now!